Following up on Renjun Bian’s recent Patently-O post, I wanted to highlight Texas A&M Professor Peter Yu’s new article on Chinese Intellectual Property Scholarship titled “A Half-Century of Scholarship on the Chinese Intellectual Property System.” The Chinese patent system is now over 30 years old — with explosive growth and transformation each year. Yu explains in the article that China is now reaching a new stage that calls for the country to move beyond Western constructs of IP (“legal transplants”) and instead “devise its own intellectual property strategy.” Because the Chinese legal marketplace continues to develop, Yu’s work here offers excellent guidance by focusing more on flow and transition rather than a snapshot. Great work Prof. Yu. 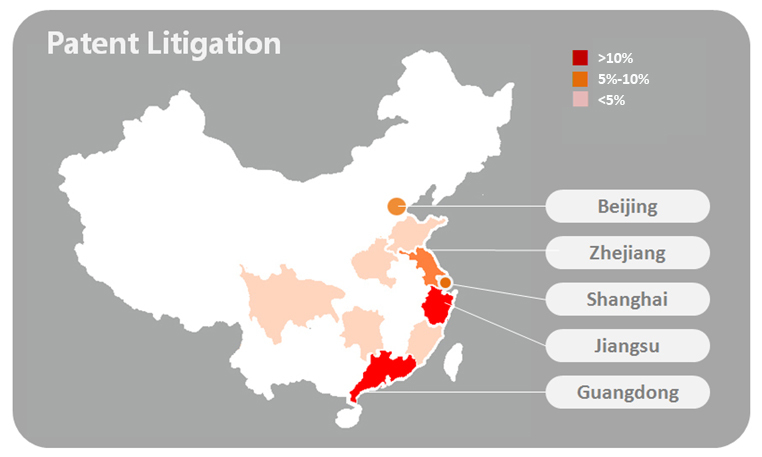 *** The map above showing regional patent litigation comes from the Chinese Firm Jiaquan IP. http://www.jiaquanip.com. The map is wrong – Zhejiang and Jiangsu should be swapped. Make China Great for the First Time!